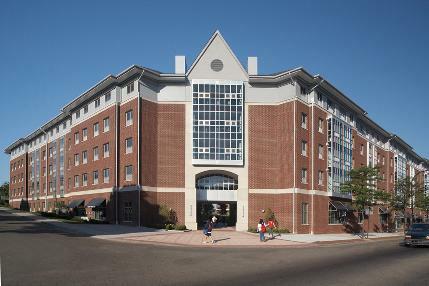 The Exchange Street Residence Hall is a six-floor building located on the southwest quadrant of the University of Akron campus. This facility is home to 476 students in a combination of two and four bedroom apartments as well as shared single rooms. The facility also has computer laboratories, social lounges, study lounges and first floor retail space. The 195,000 square foot project was completed for the fall of 2007 semester and construction was on time and within the 26 million dollar budget.